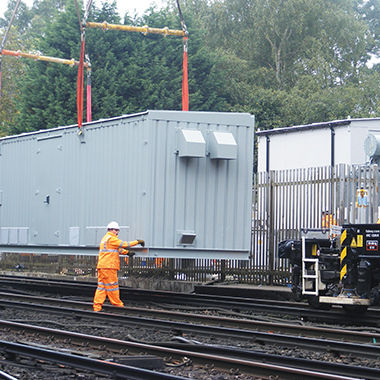 With the rail industry heavily involved in installing new systems and upgrading AC / DC electrification, signalling and secure power supplies, Bradgate has completed a number of flagship projects for clients with varied and highly specific requirements. The flexibility of our products means we are able to build complete solutions for virtually all applications. Our modules are all-steel fabrications with well-proven bonded-panel or fully welded construction, according to the project’s specifications. Both methods offer a very strong, rigid structure – which is essential to protect equipment during lifting and transportation, as well as at the operating site. Among the rail specifications we manufacture to meet are BR1615D, in which bonded-panel buildings are constructed in pre-finished material that requires no painting or maintenance and the Network Rail specification 21030. There is flexibility for customers too. The re-locatable equipment buildings (REB) that we design and manufacture can be positioned and moved around the network as upgrade projects take shape and needs change. Bradgate REB designs include four integral lift lugs at roof level, which avoids the need for special lift frames. Single or multiple room modules/containers designed to accommodate LV and MV Switchgear, UPS and batteries.